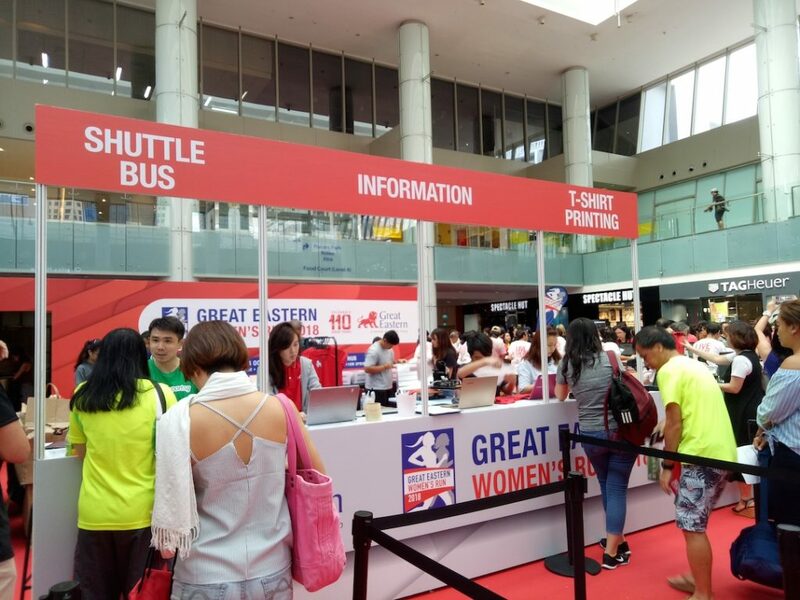 The Great Eastern Women’s Run (GEWR) has established itself as SouthEast Asia’s largest all-women’s run. 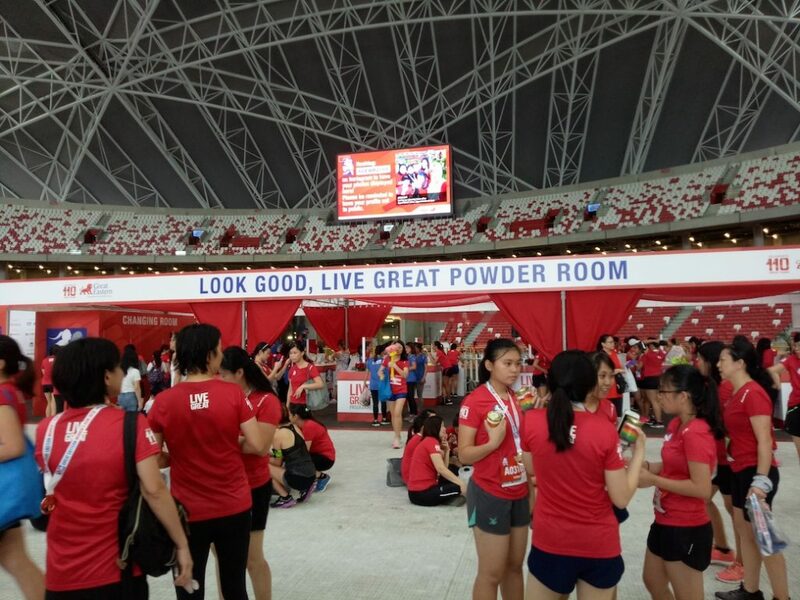 This year, they celebrate their 13th edition with a brand-new location at Singapore Sports Hub. 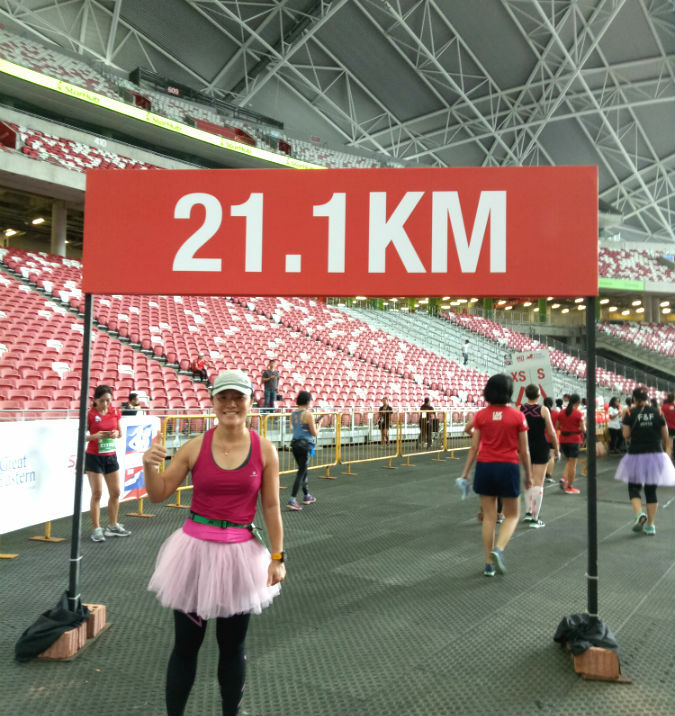 In addition to the 5 race categories (21.1KM, 10KM, 5KM, 2KM mummy & me, Princess Dash), there is a new category this year which is the 110-meter sprint. 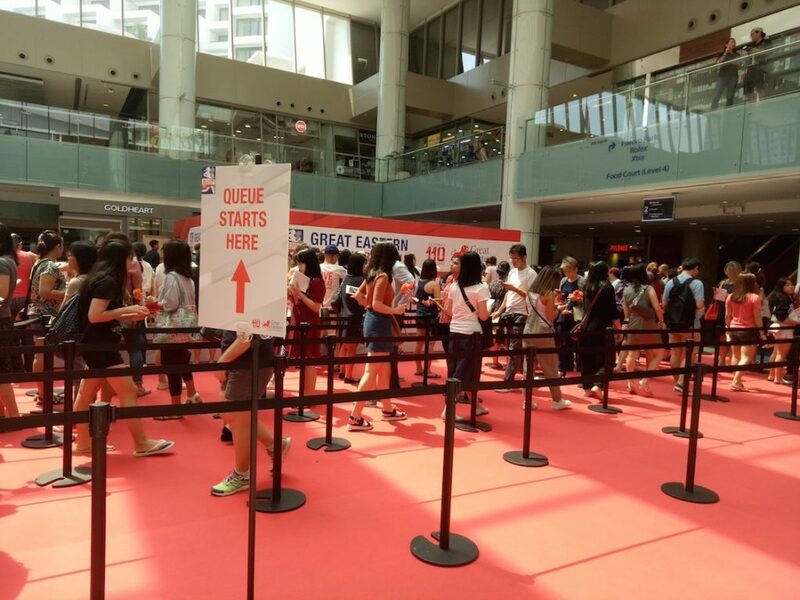 It’s the first time that a sprint event has been added to a mass running event in Singapore. This is my 3rd year participating in GEWR. 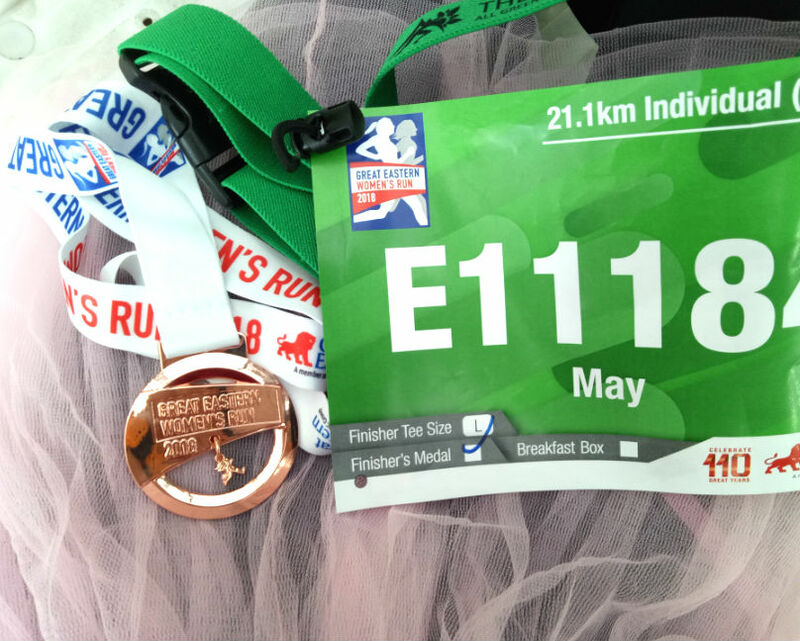 I ran the 21.1KM category in 2016, 2KM mummy & me run with my daughter in 2017 and this year, I am back to running the 21.1KM category again. The reason why I am attracted to GEWR is due to the all women’s nature. It’s quite distinctive and special to participate because the men don’t get to run. 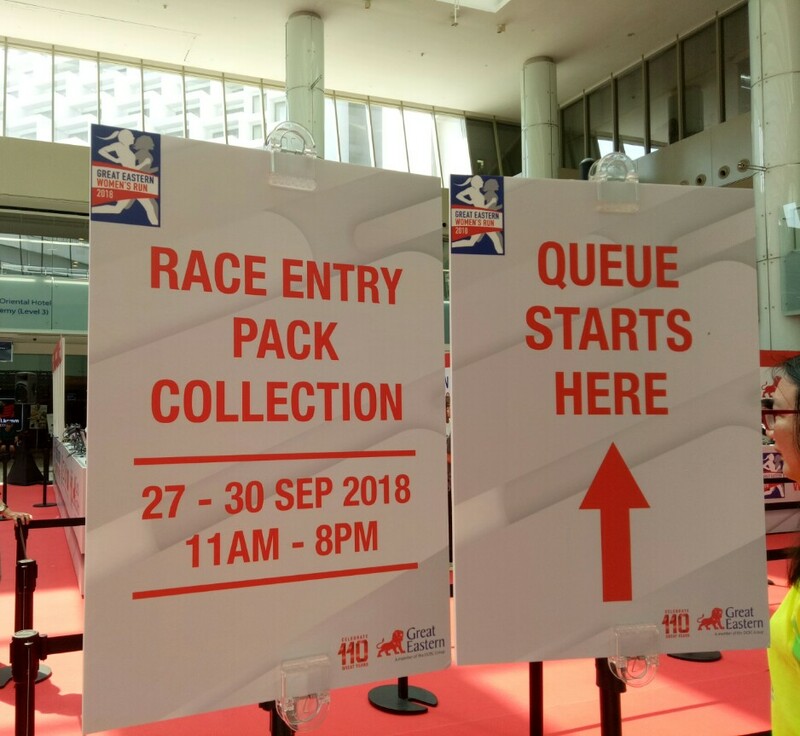 Race pack collection is held at the usual venue at Marina Square from 27 – 30 September 2018. When I went to collect mine on the first day in the morning, there was very little people and the collection process was fast and efficient. As I registered for the race late, I did not get to choose my size for the running tee and finisher tee because smaller sizes were out of stock. I was forced to select a large size which I can’t wear. I requested to change to a smaller size at the information counter, however I was told that only size L and XL are available, no more smaller sizes available for exchange. I was also told that the cutting of the shirt is quite small, so I was advised to have a look at the sizing. Yes, the cutting is smaller than last year’s but a large size is still too big for me. I had no choice but to seek to do exchanges on my own by asking around. I love the bag that was given as the race pack. It’s unique and of good quality. I arrived at the race venue by shuttle bus and there was already quite a lot of people. I walked to the multi-storey car park where their baggage deposit and holding area was. The portable toilets were outside of the car park. 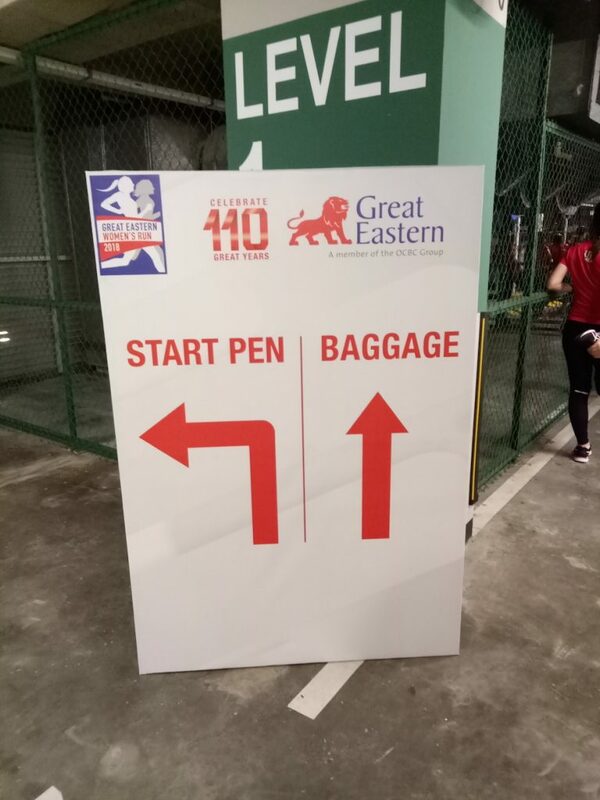 At first I had a problem finding the start pen. Then I started to see people gathering around the car park entrance/exit and it became clear that it was the way to the start pen and I could see the starting arch quite a distance away. Then we were instructed to start walking to the start pen. It was a cool and windy morning. I received SMS from GEWR informing us of a possible moderate rain but confirming that the race would go on. 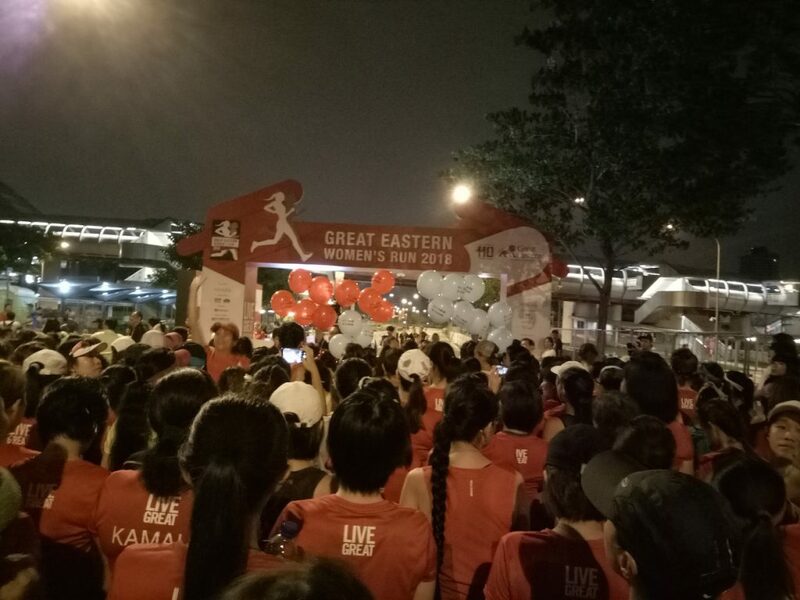 We were preparing to be flagged off and at close to 5:15 A.M, suddenly organiser was informed of Category 1 weather that was happening at that time, so we were asked to turn back. I could see that many ladies were unwilling to do so and still hanging around. 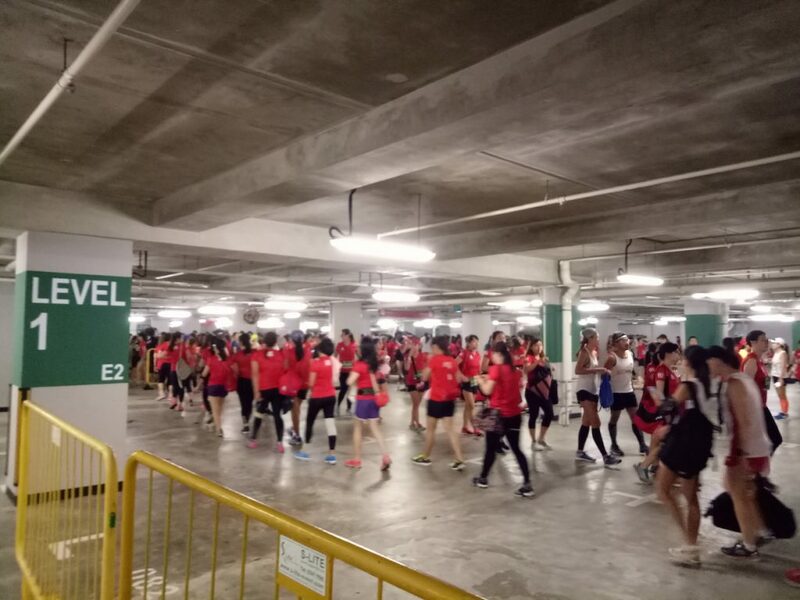 We walked into the national stadium to seek shelter and shortly after, I could hear the loud pouring rain outside. 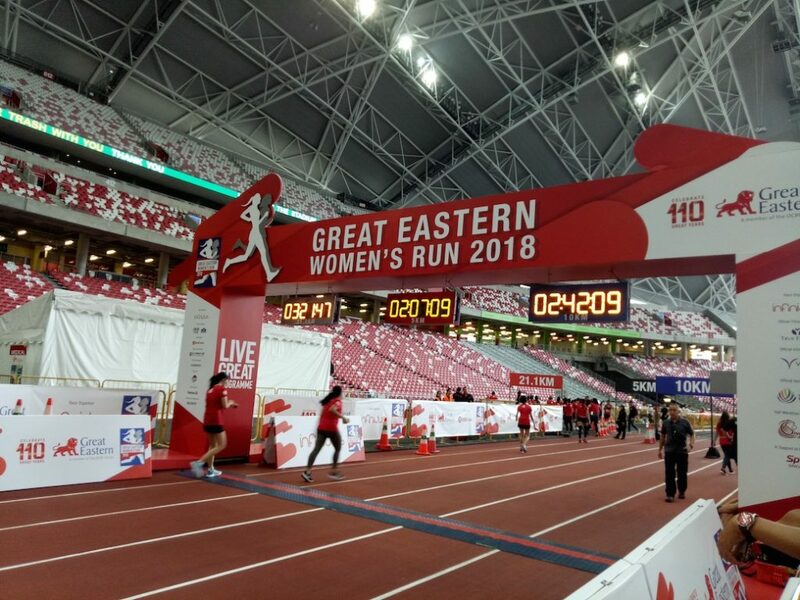 In the stadium, there were 2 large screens that would display the instagram images of people who posted with hashtag #GEWR2018. After sitting for close to an hour, the rain and thunder stopped and it was announced that we could head out to the starting pen again at 6:00 A.M and flag off would be at 6:15 A.M. Another SMS was sent informing us of the go-ahead status of the race and for those who decided not to run, could collect their finisher entitlements in the stadium. The elites were flagged off first followed by the rest of the runners about 5 minutes later. We started running under cooling weather and slight drizzles. It was a pleasant and wonderful condition for a run. 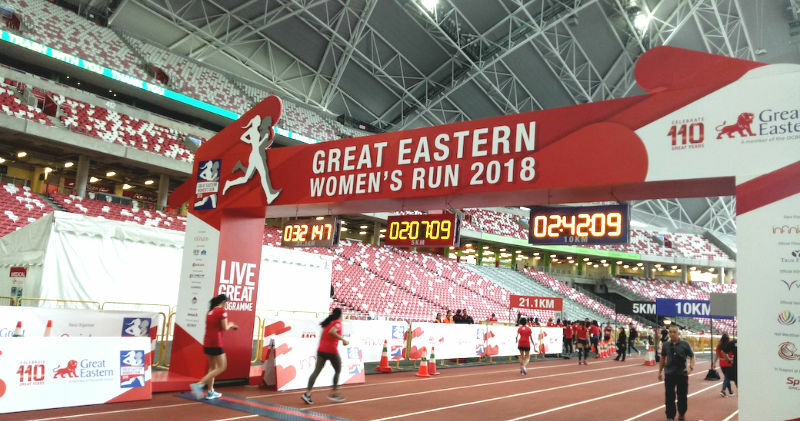 The run started along Nicoll Highway passing F1 Pit Building, Singapore Flyer, Esplanade, Gardens By The Bay, Marina Barrage, Marina Bay Golf Course and finishing inside the National Stadium. This city route is quite scenic and even better without the sun. 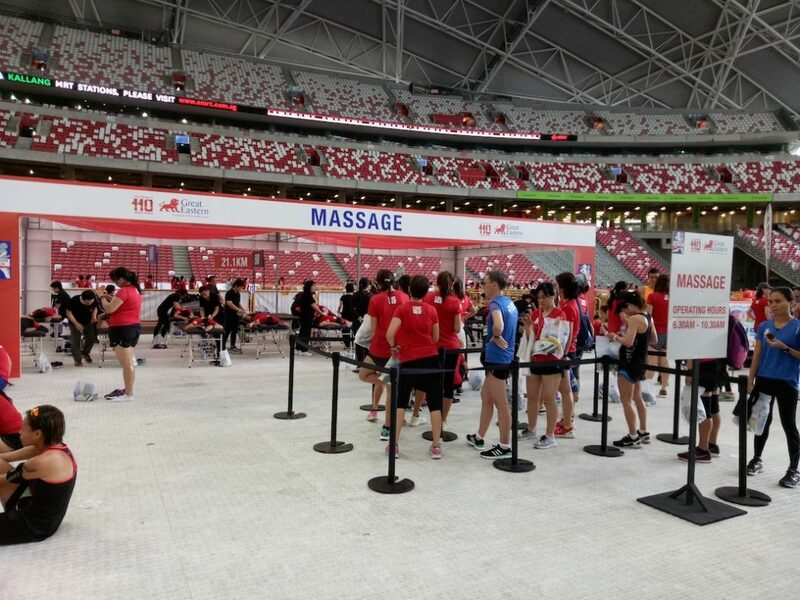 The hydration stations were at 2 – 3 KM apart and they serve mineral water and 100 Plus. Distance markers were accurate. The beautiful 2:30 pacers were very encouraging and uplifting. It was nice running together with them but after 10KM, I slowed down to hydrate and couldn’t catch up. Banana station was in between 13 and 14 KM mark, I took one and there were plenty. I decided not to look at my HR and kept pushing. I knew it was high. My PF was manageable and did not cause me too much pain, though I could definitely still feel the presence. New insoles helped. 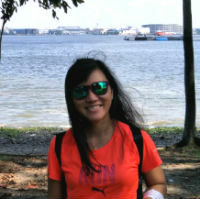 After Tanjong Rhu Suspension Bridge, there were guys giving high fives and gummy bear sweets! I kept running and told myself to stop only at the finishing line. It was getting too crowded at the last 1 KM as there were many 10 KM runners and mothers walking with their beautiful daughters. I had to move slower trying to manoeuvre among the crowd. 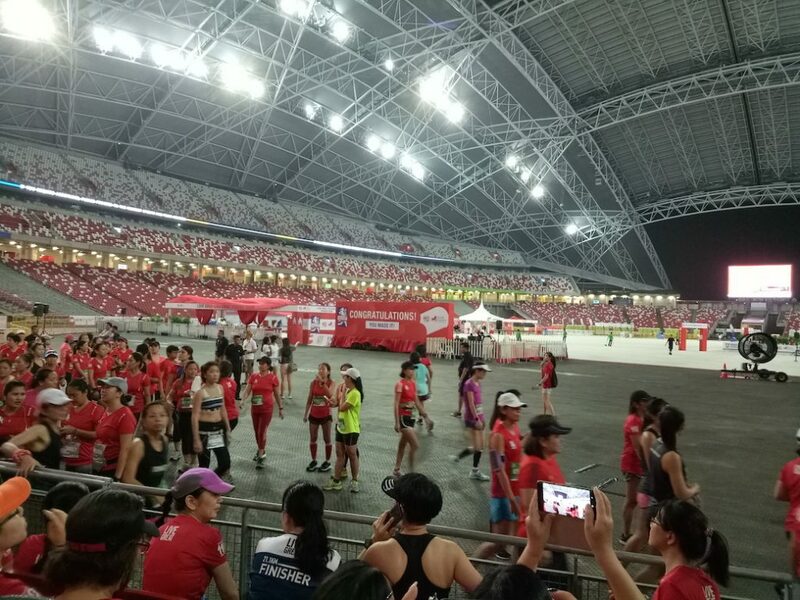 It was sweet to end the run inside the National Stadium! In my opinion, it was the best venue ever. It was sheltered, so you don’t have to care whether it is raining or scorching hot outside and still get to enjoy the post-race activities and food. The finisher item stations were classified under 100 Plus carbonated and non-carbonated. I went for non-carbonated. Never a fan of carbonated drinks. I was given a can of 100 Plus, a bottle of mineral water, a banana and breakfast pack (muffin and chicken pie from Polar). I gulped down the can of 100 Plus to quench my thirst. The finisher medal has a stunning rose gold colour and of similar design as last year’s. The race village had various food/beverage stations, bouncing castle for kids, powder room, massage, photo booths, etc. I explored for a while before heading home. 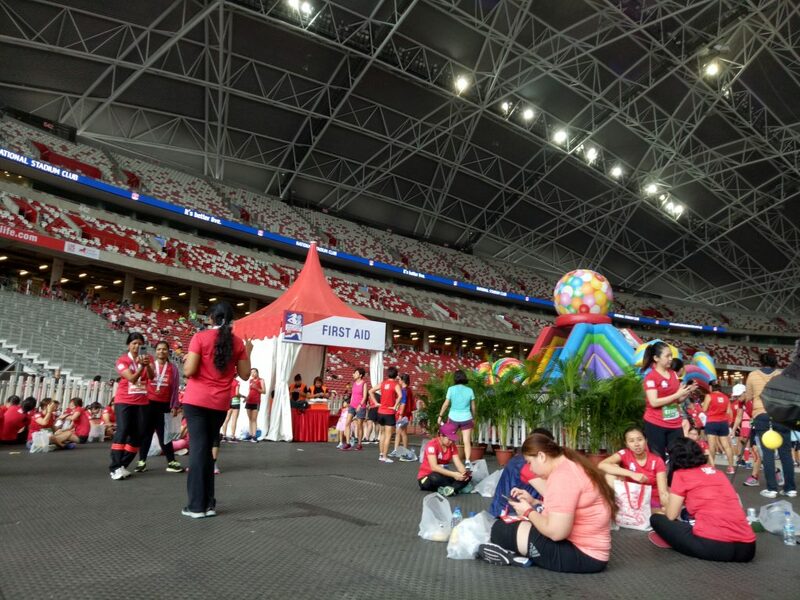 The short walk to the Stadium MRT station was a plus point for having the race venue at the Sports Hub. Kudos to the organiser and I really enjoyed this year’s experience.